Here's a collection of links about Git that I've found useful. I've been pretty involved in teaching people about version control recently and have used these resources to teach myself. If you want to see another link added, leave a comment or issue a merge request. I'll make sure you're credited on this post. A fantastic first-run introduction to git. Covers just the basics. Completely interactive and all training takes place inside the browser. I really love Codecademy, they have tons of free courses ranging from programming languages, to frameworks, to APIs, and now onto version control. A highly-interactive tutorial, just like Try GitHub, just a bit more in-depth. Highly recommended. A great VERY in-depth tutorial for git. Covers lots of subjects, but is quite text-heavy. Relies on local git and having Ruby installed. If you have a Linux Academy subscription, I highly recommend this git course. It walks you through Git, GitLab, and GitHub. From basic usage to management. Another VERY in-depth book about git. Always up-to-date, but a bit dry. It isn't written in a tutorial-style, it's more of a tech book. Good for some people, bad for others. I use this site as a reference all the time. If you learn from reading textbook examples and diagrams, Udemy has a course available for Git training as well. It's a bit wordy, but the content is solid. A super-light cheat sheet for everyday git operations. If you want a simple walkthrough of the most basic git commands, or just forget when to use git revert, check this page out. An absolutely wonderful single-page reference. The information isn't too dense, and will be very helpful to those new to git who just need to remember a few commands or remember the syntax of something. Totally bookmark-toolbar-worthy. Not a single-page reference by any stretch of the imagination. This site has everything you could ever need. Combine your favorite search engine and site:http://www.git-scm.com/ for some truly stellar search results. 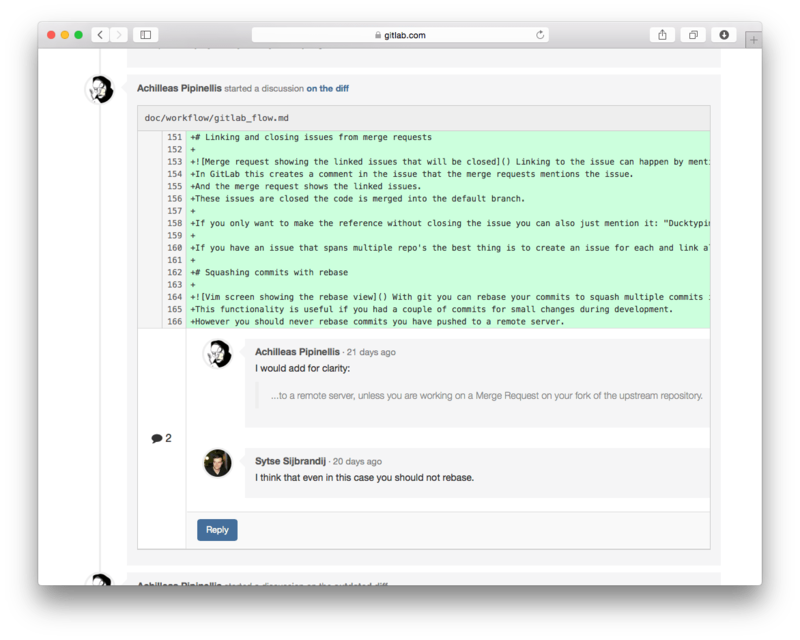 A lesson on why commit messages are the most important thing to get right when using git. Commit messages are your messages to the universe, important, meaningful, they stand on their own. Commit messages as art. Who cares about commit messages? Seriously, no one cares. Put anything you want into them, the pull/merge request is what matters! Have the discussion, collect s and s, gather in-line code comments, and hash it out there. Anyway, the view is better from the merge request. You should probably read both links above and make your decision. Software development and version control especially is not one-size-fits-all. Some shops will focus on the commit itself, others value the pull/merge request and attached discussion. Some shops are literally one guy and his side project that no one will ever look at so who the hell cares anyway? Do the research, try things out, pick the best method for you and your team. Dubbed "Git Flow", this model is one of the biggest original git management workflows. I've used it for countless projects and it works pretty well. The only real downside is that it can be overbearing for smaller projects or teams. A very simple Git Flow model, without the baggage. Companies without proper testing or CI integration should not use GitHub Flow. It really is suited for internet-based services and projects. There's one rule: master is always production-ready and deployable. And from there the process starts over. GitLab flow is a teeny tiny bit more complex than GitHub flow, but is still quite simple compared to Git Flow. The only difference is that instead of a single master branch, you have different environment branches (with master being deployed to your staging or pre-production environment with every commit), while all development happens on master via pull/merge requests. This process ensures that all features are stage-gated through each environment, cutting down on potential problems or downtime. GitLab Flow also has the concept of release branches, but those are only useful if you're releasing versioned software to the outside world. Check out the link to learn more. If you have an interest in this kind of work, you'd better check out Semantic Versioning. It's a great way to version software and keep outside developers happy. Many open source projects are now using this system. It's way better than the old odd-numbered-dev-versions system.